From this past Saturday through Monday I was on an Adventure Korea trip to Seoraksan National Park, an area that had been highly recommended to me for hiking. Seoraksan spans four cities and counties in the Gangwon province, which makes up the north eastern corner of the country. I brought my backpack with me to school and went straight to the bus stop when I left work for the day at 4:30. I didn't get to Hongdae (in Seoul) until 8:00 that night! Terrible traffic + waiting for the bus to come + metro time = way too much time getting from a to b. I got dinner with Anne while Maggie and Abby were still in route. The four of us enjoyed our view from the 15th floor during the few hours we spent in our hostel room. I was up at 6:30 for the 7:00 bus pick-up time. Due to heavy traffic, we were an hour behind schedule from the get go. I think the ride was supposed to be 3-4 hours, but it took more than five hours. There were a few different hikes to choose from after our bibimbap lunch. 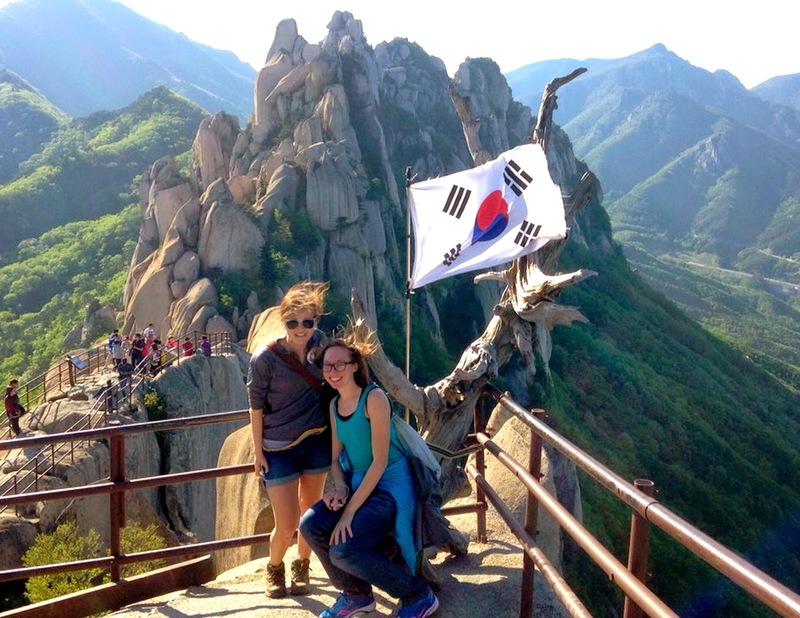 I went with Abby on the "difficult" hike, which took us up past Ulsan Bawi Rock. That rock can be pushed, and you'll see it rocking back and forth, but apparently the park owners are convinced it's not going anywhere because people are encouraged to give it a shove. From that point the hike got a bit more rigorous, with a steeper incline and many, many stairs. But the views were well worth the leg workout. Pictures simply cannot do this hike justice, as there was usually a full 360 view to admire, though I'll go ahead and share some anyway. There was a man taking pictures for everyone up on top next to the Korean flag, so Abby and I were sure to get our picture taken. While hiking up I could feel the burn in my leg muscles, but coming down my legs would not stop shaking. I hadn't realized how taxing it is on them to walk downwards. I'm not sure exactly what time we started hiking, but I think the hike must have taken us at least three and a half hours. That's part of the fun of a weekend away in nature though, not needing to know what time it is. My mind was absolutely free to admire and appreciate the natural beauty that surrounded me on the hike. Once we made it back to the bus, it was an hour's drive to the motel where we checked in, got dinner nearby, and went to bed exhausted. A good tired, though.